Learning is a lifelong process. Even a person at the end of his or her life says, ‘Had I done that…’. The philosophy of education and teaching profession keeps changing in the course of time. The traditional meaning of teacher has been modified as soon as the technologies emerged into the social life. The new digital technologies in daily life have transformed the socio-cultural aspects, educational norms and learning strategies. It has mounted the responsibilities of teachers, institutions and community to understand the fast-changing society and move with the time. At the same time, smart technology has already been accepted as a part of daily life. With the advantages of using smart technology, the technological environment has also generated challenges for the teachers, schools and communities. Social mobility, migration and transformation of values and norms have consistently engendered various innovations, options and obligations in daily life. Such movements develop some aspects of the society as well as endanger some identities of the human beings. Among the several identities of different communities, language is one of them. There are still over 6500 languages surviving in the world although most of them are limited to verbal form only. After the World War II, the rapid social mobilisation brought several changes in social life. The development of computer technology emerged into our daily life. It increased industrialisation, international business, globalisation of education. The developments created such an environment where the world had to redefine ‘education’ as per the social needs and changes. The national institutions in different countries were renamed as International; these international institutions followed the way of world trade organisation. Education then has been driven by business motive rather than social transformation. Consistently industrialisation dominated socialisation and demanded socialisation according to industrialisation. When we review last two decades of global change, industrialisation has led socialisation. Industrialisation of natural resources, human resource, technology, ideology and education has changed the way of socialising in the modern world. No nation can survive independently in the world today. It has been imperative for every country to share products, skills and bills. The powerful nations accelerated industrialisation and internationalised their products. The internationalisation of every product in a country demanded link language to communicate with each other. The underdeveloped and developing countries as consumers of multi-national products had to learn the language of industrialised nations. For instance, English, French, German, Japanese, Spanish, Russian and Chinese languages have been international languages due to their industrial development. Whereas, thousands of other languages are in the line of extinction. Technological development has much deterred the use of other languages existing in different communities in the world. Over 2000 languages with less than 1000 speakers are going to extinct soon whereas other several languages are dying gradually. With the development of Web 2.0 technology in the new millennium, the world has been much controlled by the English language. The recent online information states that the English language has occupied over 90 percent digital information world. It is evident that the English language has been an international language and official language of many countries. The internationalisation of English language has been dominating other languages in the world. The acceptance of information and communication technologies (ICTs) in education has much accelerated in the development of English language in the non-native ground of English language. This issue of http://eltchoutari.com/ presents various experiences of English language teachers from different countries in South-East Asia, Middle-East Asia and West Africa. It shares English teachers’ ICT practice in English language teaching and learning in various contexts. Teachers from India, Bangladesh, Pakistan, Vietnam, Jordan and Ghana have also written about ICTs in English language teaching and learning in their contexts. Their contribution along with the English teachers from Nepal has made this issue a more reflective and hopefully productive. Jeevan Karki, one of the editorial team members of this digital portal, has highlighted how the teachers can integrate mobile phones into English language teaching-learning activities and also shares the practices of English language teachers of remote schools of Nepal. In another post, Dr. Kofi Ayebi from Ghana has described the strategy of ICT integration in education from primary to tertiary level. He highlights ICT in primary school education as a fundamental course to prepare the children for higher level school. The government of Ghana has executed ICT in education policy at all levels with the aim of developing the skilled human resource to meet the requirement of the industry. Ghana equally emphasises the English language in institutions and official purpose. SM Akramul Kabir from Bangladesh describes the situation of ICT use in schools in Bangladesh. He points out the challenges of implementing ICT in education policy in teaching and learning where there is a lack of skilled teachers and technology support. Although there are schools in Bangladesh trying various forms of ICTs in instructional activities, he says that insufficient IT support for the academic institutions across the country, lack of high-speed internet connection, and frequent power cut problem in rural and suburban areas are major issues to be fixed to execute ICT in education policy successfully. Ambadatta Joshi from Nepal who has been teaching English in a primary school with digital devices (Laptop) reflects his lifelong learning. His schooling with Dhulauto (a wooden flake with dust on it) to teaching with digital technology can be an inspiring story for many teachers and learners in the world. Upendra Ghimire in another post suggests some advantages of mobile in English language learning. Thinh Le from Vietnam explicates that his practice of online tools resulted in good after a long online teaching and learning activities. His experiential writing may encourage many school teachers and learners to use digital tools such as Skype, Moodle, Zoom, Facebook or other tools to communicate with each other, discuss lessons and share ideas from distance virtual environment. Similarly, Muneir Gwasmeh from Jordan shares his English language teaching experience in Jordanian and Abu Dhabi schools using audio technologies. He considers that digital technologies provide the second language learners with an opportunity of learning the language in the absence of teachers or even what the teachers missed. Haprpinder Kaur from India explicates that how a school teacher came to learn the correct English pronunciation with the support of smartboard in the classroom. Her reflective writing may insist the non-native English teachers teaching English in the exotic ground to rethink about their English language teaching. It also suggests that the teachers have to learn to use digital technologies to upgrade their knowledge and skills. Similarly, Shaista Rasheed from Pakistan suggests the teachers use online tools to teach English as well as other subjects. Her experience of using Google group in English language teaching can be a good example for English language teachers. In this connection, Choutari editor Ashok Raj Khati has talked to Dr. Balkrishna Sharma, Praveen Kumar Yadav and Dr. Shyam Sharma to reflect back the seven years journey of ELT Choutari. In the same line, one of our regular readers, Narendra Singh Dhami, explains on how he exploits this forum for his day-to-day teaching. Finally, the thanks go to the contributors who have given their invaluable time to share their experiences, ideas and researches. At the same time, the team of Choutari who have constantly been putting their efforts to develop this platform equally deserves credits. To bring out the special issue, I am also grateful to the members of the editorial team, Ashok Raj Khati, Jeevan Karki and Praveen Kumar Yadav for their editorial and technical supports. Mr. Rana is a PhD Candidate in the School of Teacher Education, College of Education, Health and Human Development, University of Canterbury, Christchurch, New Zealand. In the midst of long silence because of technical and other issues, we are back with the special issue of ELT Choutari. This is the second issue of this year which focuses on several aspects of ELT. Before listing out the blog entries of this issue, let me reflect on my experience and observation on some aspects of ELT. I am fortunate to observe hundreds of English lessons in the past two years in rural parts of Nepal. My experience of working with teachers in schools and training venues in diverse topography and culture in Nepal has shown that many teachers are still facing challenges in lesson delivery process. ‘Fresh’ university graduates who have ‘successfully’ completed pre-service teacher education program have been unable to deliver English lesson really effectively though having authorized license to teach. Then where is the problem? In my opinion, the problem lies in the way we perceive a language, our profession (ELT) and the meaning of language teaching. The problem lies on how we make sense of a language to be taught as a course, the language to be used as a medium of instruction and the content to be taught (if it should be). Every human being makes sense of the world differently. They obviously have their own ideas, concepts and perceptions towards overall meaning of language teaching. In this light, I have similar observations as Rebecca Reymann, a contributor of this issue has, in many parts of the country. We as teachers are investing our effort in memorization. I agree with her in a way ‘language is a beautiful tool for expression’. It has to be taught in a context differently in different grades but not through memorization. Every child is unique and he/she does not get success in language learning through the same route. The children have their own perspectives toward the language, language learning process and the world. In the same way, they have their own ability to grasp language. So far we talk about ELT as a teaching profession, many of us might have different explanations for this choice. 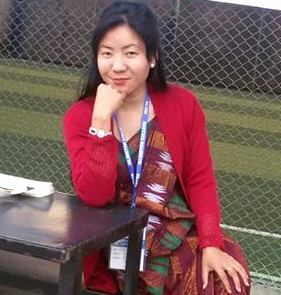 Samita Magar, another contributor, decided to pick ELT simply because she is influenced by her teacher when she was in school. She finds this profession more creative and respectable than others. It shows that the identity of English teacher is perceived differently by different people. In the past, to some extent teachers had an uniform identity. They were considered priests, the messenger of Gods and the personalities with high morale. In the east, this sort of identity is still in existence to some extent. However, the overall observation of English teachers’ identity has been changing with time. It is witnessed at present that there is no uniform opinions and beliefs why a person chooses ELT as a profession. Likewise, as the time has changed in the way we teach children, the way teacher educators and trainers facilitate training sessions has been changing. The focus has been shifted to the achievements of the students along with the teacher learning. Ekraj Koirala, a teacher trainer, recently experienced a better way through school based teacher training modality in Nepal. Teachers have different expectations and challenges in their own contexts. In this regard, the same cascade model may not be appropriate in all cases. At the same time, the approaches of teacher education in universities and academic institutions have been changed. Distance and open learning system have been introduced by several universities to prepare teachers. Similarly, private schools have different requirements for recruiting teachers and government has its own. Kiran Thapa, a scholar from Kathmandu University, discusses issue of certification and licensing of English teachers in Nepal. She highlights the significance of certification and licensing to maintain minimum standards and add quality in education. Another changing dimension in public education is the shift towards English medium instruction from Nepali. Choutari editor Jeevan Karki has spoken with Juliet Fry, a teacher educator, who emphasized the continuity of multilingual approach in Nepal. She has strongly articulated her voice over the significance of Nepali, English and other local languages to generate economy, and to preserve the identity and culture of Nepal, which calls for a balanced approach and multilingual education. Similarly, there has been a great shift in testing system. From this year, the government has introduced letter grading system to assess SLC graduates and different forms of letter grading system was already in practice in school education. With reference to testing of English language, Shyam Sharma in a blog piece, states that monolingual tests don’t predict overall academic performance by multilingual students. On behalf of ELT Choutari Team, I would like to express my sincere thanks to all team members, contributors and reviewers of this issue. As the commitment to our valued readers, we are investing our effort to release ELT Choutari as quarterly publication. At this hour, two new members have joined our team to continue this professional legacy of local and global ELT discourse through this platform. Juliet Fry, a national director of professional learning of secondary teachers’ of English language in New Zealand will be supporting us in the capacity of the guest editor. Likewise, Karna Rana, a PhD candidate from University of Canterbury New Zealand will be contributing Choutari in the capacity of editor. Special thanks to Jeevan Karki, Karna Rana and KP Ghimire for their support to bring out this issue. Hope you will enjoy the readings. We will be grateful for your ideas and comments on the blog posts. On behalf of the ELT Choutari team, I would like to wish everyone a slightly belated Happy New Year 2016! And welcome to a special Anniversary issue once again!! This is the eighth year of our blogging about ELT. We are grateful to you for reading and promoting the ELT khurak we provide here. And we are grateful to those who have contributed to this issue. Your contribution to professional conversations here is invaluable, as always. The last year 2015 remained the year of despairs in Nepal especially due to destructive earthquake and five-month-long crisis resulted due to discontented voices of communities especially Madhesi, Tharu and Janjatis following the country’s new constitution. It has affected all walks of life, and education and ELT in Nepal have been impacted as well. But we also believe that as educators we can play a role: we can understand and communicate issues, we can rethink education at all levels, and we can even improve our day to day teaching. It is not just a coincidence, therefore, that the writings in this issue address difficult issues of power and struggle, opportunity and justice to the general masses. Bearing the responsibility of representation of the Nepali people, the Constituent Assembly (CA) presented a constitution for the first time in Nepal’s history. The constitution has ensured Nepal as Federal Democratic Republican state with three-tier government (federal, provincial, and local), competitive multi-party democratic system, secularism, inclusion and policy of proportional representation, president as ceremonial head-of-the-state, people’s sovereignty and fundamental rights including economic, social and cultural rights. It is for professionals and educators in all fields to help realize the aspiration of the people by contributing through the means at their disposal. Education is arguably the most powerful means for social transformation. We will welcome fellow educators to share ideas with broad social vision through this venue. We are yet to understand how the sociopolitical changes above will affect education, but as educators, it is our role to make sense of the change, to shape it, to give it meaning. It is for us to make the best contribution we can to the education of the future generations of Nepalis. We certainly cannot continue to do whatever we have been doing; we can and must invite others, ignite ideas, and involve ourselves in conversations about change, about where and what and how we can be most productive and professional in the new contexts. At Choutari, we plan to produce new issues on special themes and issues. While we are likely to publish on longer time intervals than before (most likely quarterly instead of monthly), we will remain the open space run by independent volunteers, continuing a tradition and adding a necessary dimension to professional conversation. Here we reflect on the past, present, and future of our work. We would like to invite you to consider joining us and contributing as directly as you can. If you can spare the time and have new ideas, please contact us; this could be your means of impacting the professional lives of English language teachers across the country (and also across the world). We have thrived on the power of volunteerism, volunteers with knowledge and experience, passion and energy, technological skills, and a desire for collaboration and networking. If you have any of these to contribute to the community, or have questions before you join, please do not hesitate to send them at eltchoutari at gmail.com. Thanking you again for your continued readership and your support, and wishing you a great year ahead again. In this anniversary issue, Prem Phyak, a PhD scholar in University of Hawaii, dedicates a blog post to the legacy of a famous applied linguist, Professor Alan Davies. In the context of sad demise (in September 2015) of Professor Alan Davies, the author shares some of his major contributions in relation to teaching, discourse, ELT policy and Applied Linguistics in Nepal. In the second post, Tikaram Poudel, assistant professor in Kathmandu University, examines the texts relevant to influence of English on Nepalese society and provides a fresh perspective for looking at the socio-educational issues of Nepal in relation to English language in education. In the third post, Shyam Sharma, assistant Professor in Stony Brook University, New York, appreciates and analyses the benefits of multilingualism in relation to Nepal’s multilingual context and education. In another post, Uttam Gaulee, a PhD scholar in University of Florida, recalls the days of his principalship in an English-medium school in Nepal, and provides the perspective on harsh socio-economic inequality and division created by public and private (English-medium) education. Likewise, in another post, Doreen Richmond, a teacher educator in the USA, who did writing lessons in some classrooms and training sessions in rural parts of Nepal, shares her experience of teaching writing as a process to younger and older students. In another blog post, Hem Raj Kafle, assistant Professor in Kathmandu University writes on his PhD experiences, a thoughtful memoir of his six years engagement in Kathmandu University. In this blog post, Dr. Kafle provides deep thoughts on the process of pursuing PhD and the product of it. Hem Raj Kafle: Post-PhD Ramblings: What is There to Remember? On behalf of ELT Choutari Team, I would like to express my sincere acknowledgement to former team members, contributors, and readers for continuing this professional legacy of local and global ELT discourse. Hope you will enjoy the readings. We will be grateful if you could share your thoughts and comments on the blog posts and also share them with your networks.